To send flowers online cheap in Riga (Latvia). Flowers online cheap are profitable! ❶ To send flowers online cheap in Riga (Latvia). Flowers online cheap are profitable! To please relatives with a stunning bouquet of flowers, saving your budget, has became even easier. Send flowers online cheap, using the services of KROKUS studio. you will find magnificent flowers online cheap in our catalog. You can order flowers online for delivery n Riga and in any city in Latvia in just 5-10 minutes. In addition, you can apply by simply calling our operator at +371 200 303 06 at any time of the day or night! The best flowers and gifts for any holiday at favorable prices are waiting for you in KROKUS. How to send flowers online cheap to Riga (Latvia)? Saving time and money are undoubted advantages of buying goods in online shops, as well as the possibility to deliver products directly to the door of your home. However, ordering flowers on the network also has an additional bonus - the opportunity to arrange an unexpected and pleasant surprise to the gifted. Really, everyone will be pleasantly surprised, having received as a gift a magnificent bouquet of bright and fresh flowers with delivery to the house. You will find the best cheap flowers online only in our catalog! The online shop KROKUS gives every customer the opportunity to send flowers online cheap to Riga or any other city in Latvia for birthday, anniversary, name day, March 8, St. Valentine's Day, anniversary of the wedding or other holiday. ● delightful daisies, lilacs, sunflowers, etc. The presented flowers serve as the basis for creating incredible designer's arrangements from professional florists, which complement bouquets with decorative plants, souvenirs, sweets, gifts. It is possible to order flowers online for delivery and arrangements from them all over Riga and other cities of Latvia only in KROKUS. To send flowers online cheap is possible using the services of our couriers. How to buy flowers online cheap in Riga, Latvia? 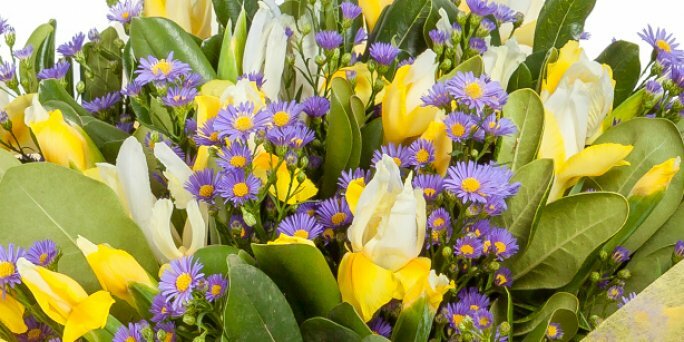 If you want to order a bouquet of flowers online for sending to Riga or to any other part of Latvia, the optimal solution will be to contact the online shop KROKUS. To make an order, use the convenient functions of our website and when selecting n arrangement, go to the "By Price" section, and select the category most suitable for the planned budget. In addition, you can get help in choosing an arrangement and order to ship flowers online in Riga (Latvia) by calling the company manager at the specified number and agreeing all the details of buying a bouquet in the phone mode.